Well, here I am at the Argent Tournament yet again. 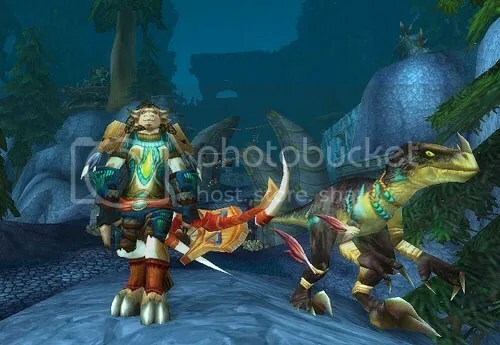 This week’s discussion of mount collecting reminded me that I am still missing some of the Argent Tournament mounts. I decided that I should just go get them, even if I’m not terribly excited about them, so that I can tick them off the list of relatively easy mounts to obtain and get my mount barn that much closer to qualifying for the Jade Pandaren Kite. My characters who have already maximized their ability to earn Champion’s Seals declined to take up this tedious chore, saying they had better things to do with their time. Thus, the task has fallen to Kinevra, my only Alliance character who is high enough level to participate in the Tournament. At least she can still get XP from it. Furthermore, after the various outfits I’ve made with the Sunreaver tabard, it will be fun finally have a character with the beautiful Silver Covenant tabard. Meanwhile, my golden, azure, jade, and onyx cloud serpents have been feeling like their clutch is incomplete without a crimson cloud serpent. Because I haven’t been doing any dungeon running with the sort of regular, coherent group that could work on heroic dungeon achievements, I’m not going to be getting the regular crimson cloud serpent. 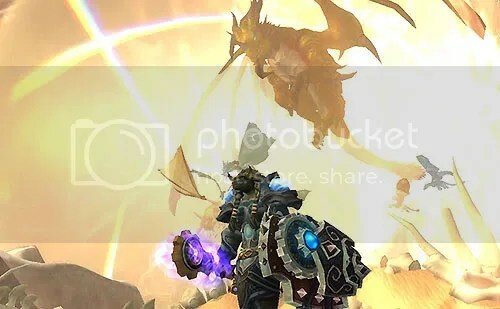 Someone was going to have to farm Mogu in the Vale for Skyshards to bring down Alani and get the thundering crimson cloud serpent. A bit surprisingly, mini-Kam decided that she wanted to be the one to do it. 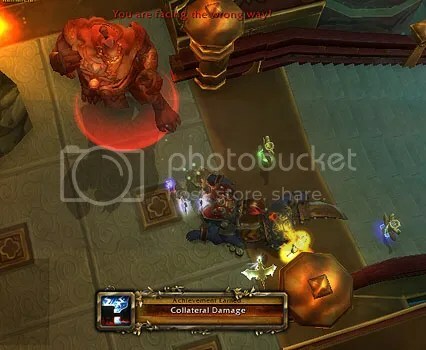 Even more surprisingly, beating up the Mogu with an Enhancement Shaman is more fun than doing it with any of other characters who’ve previously done Golden Lotus rep. This also meant that mini-Kam was going to have to start working on some Pandarian faction reps, specifically Order of the Cloud Serpents and August Celestials. After my Warrior came home from the Dread Wastes wearing a quest reward set that was dark blue with purple accents, my Death Knight insisted that she must have this plate, too! And lo, now I have five 90s. 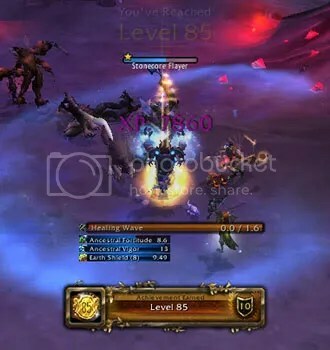 Now Ketura is clamoring to get to 90. Being a Hunter, she always does each continent’s Nesingwary questline, so she’ll start there. After that, probably Kun-Lai Summit — and then the Isle of Giants! She’s going to have to wait a little while longer, though, because I’m starting to feel a bit overwhelmed just by my other level 90 alts’ goals. I could make a handwritten list of all these objectives and show you a photograph of it, as the Godmother is so fond of doing — but I prefer to keep the list only in my head. In the past, when ideas for a particular hobby project have piled up enough that I’ve thought maybe I should actually write down the list of things I want to do so that I don’t forget anything, the very act of putting the list on paper has been enough to turn a fun project into a series of chores — and then the project never gets finished. 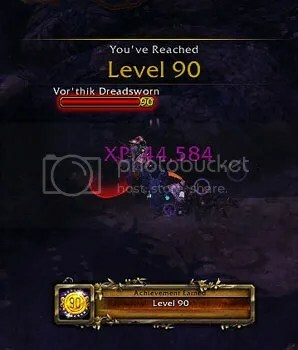 Anyhow, I’m going to make Ketura’s push to 90 wait until after Kregga has gotten her farm completely expanded. Kamalia made Best Friends with all ten of the Tillers, but the others are focusing on just four of them: Gina, for the mailbox; Tina, for the furniture; Old Hillpaw, for the Straw Hat; and Jogu, for the free crop predictions. Perhaps I will even drop Jogu, though. I haven’t been paying much attention to crop predictions recently, because I’ve been growing mostly specific vegetables for Work Orders (or other culinary needs) or special crops to supply my crafting professions. Kamalia tends her farm every day, she runs LFR one or two nights a week, and then she’s done. She doesn’t really do dailies anymore; she stopped after she reached exalted with the Sunreavers for the second time. Of my level 90 alts, Katewatha and Kregga have various reputation-based goals for cosmetic or professional reasons. 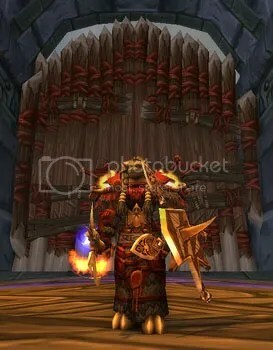 Only Keija the Warrior is interested in LFR or needs valor points enough to do the Battlefield:Barrens. Well, maybe Keija and Kregga will try to farm up the 500 Kor’kron Lumber for Griftah’s Amazing Troll Shoes — but if they don’t get it done before 5.4 drops, I won’t be too fussed. My Druid, Kerisa, would also like to get to level 90 sometime before the next expansion. I am bound and determined to get some experience with Druid healing, though, so I intend to complete her journey to 90 in LFD. Alas, my struggles with mana management when I’ve run dungeons with my Mistweaver Monk have left me feeling rather reluctant to queue for LFD as a Tree…. Meanwhile, mini-Kam has been stubbornly ignoring The Art of War. I transferred her to a PvE server, and there are certain quest rewards in Pandaria that I would like to acquire for Transmogrification (stuff I wish Kam1.0 had kept), and she still doesn’t want to go to Pandaria. Yet. Instead, she spent some time in Gundrak trying to find a Gundrak Hatchling. 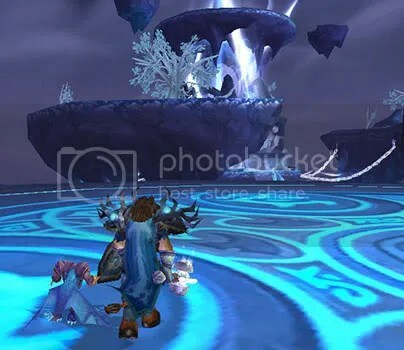 Becoming bored of that pursuit after only a few sessions, she then headed back to Outland to finish farming up the aqua Elements recolor and the black Earthfury recolor sets. 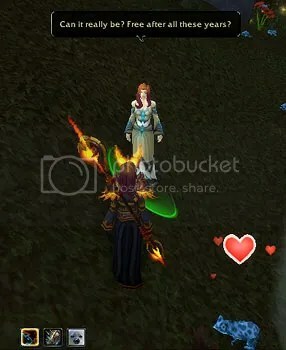 After that, she went to Northrend again, returning to the Argent Tournament to work on becoming exalted with the Sunreavers there — she wants the tabard for a Transmogrification kit. 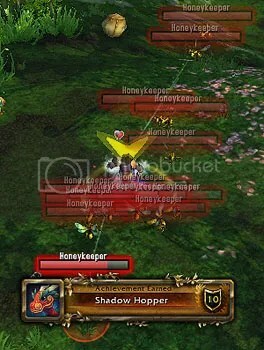 At this rate, she may not make it to Pandaria until after patch 6.0 drops! As I’ve noted before, I leveled mini-Kam from 85 to 86 on cooking and fishing dailies. 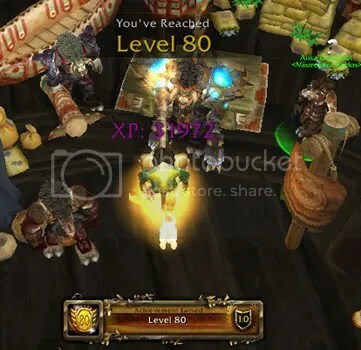 Then, using AH purchases to boost her ilevel as needed, I leveled her from 86 onward in LFD. Since the XP nerf went through, I’ve been chaining dungeons with her, running three to five in a sitting. 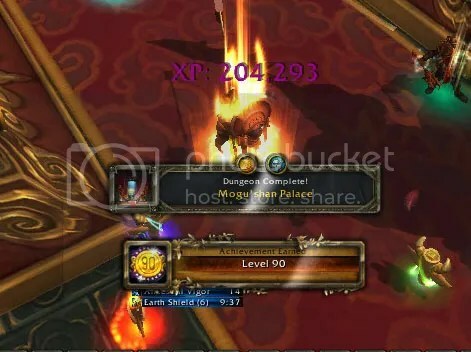 Late last night, Kamaliya became my second 90 without ever having set foot in un-instanced, open-world Pandaria. 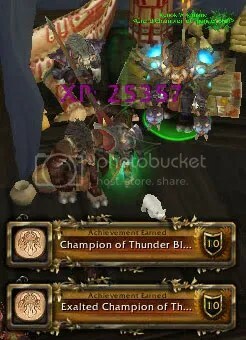 Yes, now I have two level 90 Tauren main-spec Resto Shaman. 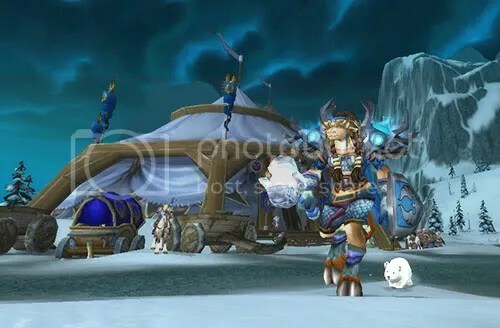 I originally created mini-Kam to be my social contact with my guild on Lightninghoof before I transferred all my other Tauren characters to Bloodhoof in late Cataclysm. I did Tier 14 LFR with those guildies with Kamalia via the wonders of CRZ-grouping, however, and mini-Kam felt less needed. In late January, the guild lost both of its main tanks simultaneously, and it didn’t manage to recover. Furthermore, all the people whose company I liked so much when I first joined the guild have either moved to other guilds or stopped playing entirely by now. Not too long ago, I decided that mini-Kam should also be the Shaman I’d use to experiment with the Enhancement specialization. I’ve very much enjoyed to not having to be always looking over my shoulder for Reavers, though, and the dailies areas on Bloodhoof are still busy enough with Horde and Alliance alike that I /cower at the thought of trying to do Pandaria dailies on a PvP server. So, sometime soon, mini-Kam will be joining the Underpowered Death Knight on Thunderhorn. I’m contemplating bringing the rest of my Tauren class doubles over there, too. 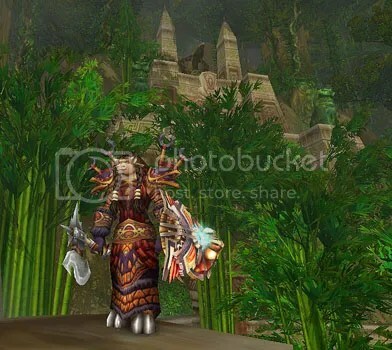 What more appropriately named garb could a Shaman possibly wear to take on Lei Shen and the desperate Zandalari? 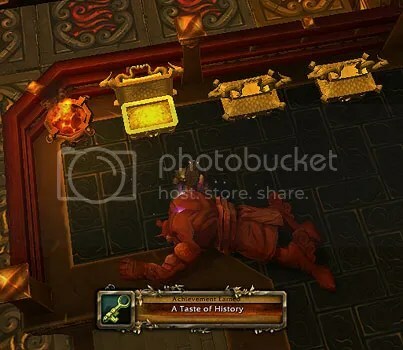 The opening of a new Troll raid — what a perfect opportunity for Kamalia to don her set of the level 70 badge gear introduced with the Gods of Zul’Aman! When I went looking for items to use with the level 85 T11-recolor Dragonkiller Tunic, the teal tones of the agility versions of the level 70 Zul’Aman mail coordinated excellently. The copper tones of the belt and boots provide a nice burst of complementary color and also tie in the bindings of the bow. 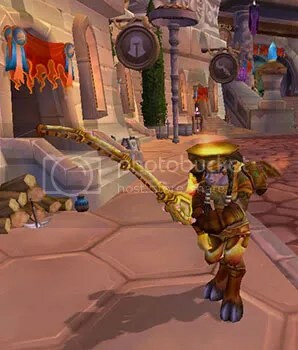 One of the most exciting things about Patch 5.2 was the expansion of Transmogrification to allow all weapons that use the same animations to be cross-Transmogrified. I’ve long thought that the Glaive of the Pit coordinates with the Starry Robes of the Crescent very beautifully, but as a Balance Druid who will never legitimately equip a polearm because there are no +Int polearms, I couldn’t use this combination in a proper Transmogrification kit — until now! When she went to Shattrath at level 60, mini-Kam was severely disappointed that Old Man Barlo wouldn’t give her any fishing quests, even though her fishing skill was already well into Grand Master (Wrath) levels. By the time she reached level 70 and he would, Marcia Chase would also give her fishing quests. 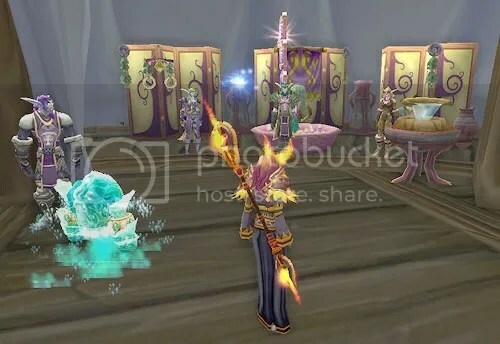 So she kept her hearth in Thunder Bluff until she could go to Dalaran, because the Kalimdor/EK and Dalaran fishing bags have the chance to award the Jeweled Fishing Pole, whereas the Shattrath ones do not. Because she had not gotten her fishing pole yet, she kept her hearth in Dalaran after she reached level 80. Presently, I realized that whereas the Orgrimmar, Thunder Bluff, and Undercity fishing dailies are mutually exclusive, the Old World, Shattrath, and Dalaran fishing dailies are not. So I started doing both the Dalaran and Orgrimmar fishing dailies. 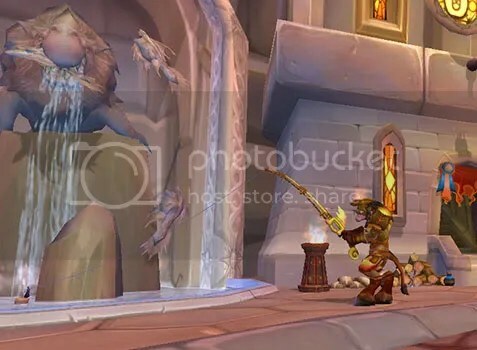 On Monday, mini-Kam dinged 84 from doing the tour of the Midsummer bonfires, and she also got that Jeweled Fishing Pole from her Dalaran fishing bag. wait, what’s that she’s wearing? Then on Tuesday, Kamalia finally won the Timepiece of the Bronze Flight in her LFR run. And today, mini-Kam became my fifth 85. Sooo… now what? Well, faffing, most likely. I probably won’t bother with gearing Kamaliya up for LFR; she’ll want to be raid-ready in Mists, but she doesn’t need to be now. Instead of spending the money to gem, enchant, reforge, and Transmogrify multiple items as she moves up through the ilevels, I think I’d rather spend some time herbing and lay in a decent supply of cash to afford such things later. Besides which, Kam2.0 wants to farm Scholomance for the Sawbones Shirt and Bloodmail Legguards, and there’s Outland dungeons to be run for other Transmogrification set items. …Kamaliya decided that it was time for a New Look. She’d won the Skyshatter Shoulderpads (T6) during a recent Laid Back Loot Raid, so she decided to combine them with her Blue Dragonscale chestpiece and leggings to make a (mostly) blue and silver Transmogrification Template Kit. I’ve concluded that Doc’s Belt is THE best belt to use with this chestpiece and leggings because of its gold buckle. I’ve been wanting to use the Spellbreaker’s Buckler on some character, any character, for quite awhile now, and its colors do coordinate rather nicely with the rest of the pieces I wanted to use. (I’ll make a plate TTK to go with that shield when one or the other of my Paladins gets leveled up enough to acquire it.) I used the Devout Aurastone Hammer to Transmogrify her mace because I already had it and it looked decent. Because Kamaliya still has some more LFD leveling to do, she’s using the blue Phantasmal Headdress to Transmogrify the red Preened Tribal War Feathers; the gold accents on the headdress and the gold accents on the chestpiece, leggings, and belt complement each other nicely. The Sundered gloves & boots and Mylune’s Cloak of Cheerful Flowers complete the set. …and a lottle Blue Dragonflight. The Silvermoon War-Mace is the exact style match for the Spellbreaker’s Buckler and would heighten the association with the Silver Covenant. Kael’thas’ Cudgel of Consecration would be another good Silver Covenant weapon. 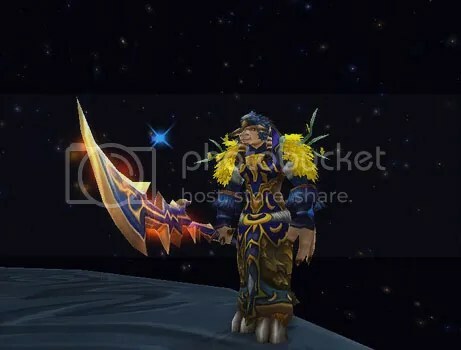 Malygos’s Ice Spire Scepter or the Starlight Dagger and the Mazthoril Honor Shield or the Lost Pavise of the Blue Flight would be great choices for playing up the association with the Blue Dragonflight. Timeslicer would be an excellent weapon choice for either association of the set. 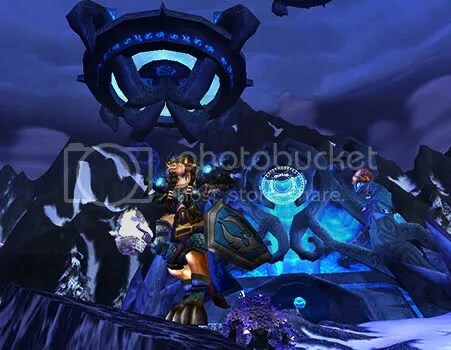 For Shaman who are already level 85, or not using Heirlooms, I like the look of the Ornate Circlet/Pillager’s Crown, the Storm Master’s Helmet, the Steamworker’s Goggles, and the Corroded Helmet.